Fairholme is an old estate in Newport on Rhode Island dating back to 1875, with over 400ft of coastline. The main property has been extended and now offers over 20,000sq ft of space. The rooms at the rear of the house all have sea views and natural light streams in through leaded-glass windows and doors. To the west are a sitting room, panelled library, and oceanfront salon flanked by a long colonnaded terrace gives way to a barrel-vaulted ballroom. East from the hall a delicately hued dining room is served by a substantial kitchen and butler’s pantry. The second and third floors host two luxurious master suites with terraces, sitting rooms, offices, fireplaces, and dressing rooms, seven additional bedrooms, and staff quarters. Overall, the property has 16 bedrooms, 12 bathrooms and sits in a 4.3 acre plot. Spanning over 4,000 square feet, the separate carriage house contains one-and three-bedroom apartments, two staff suites, an office, a gymnasium, several storage garages, and a main parking garage. 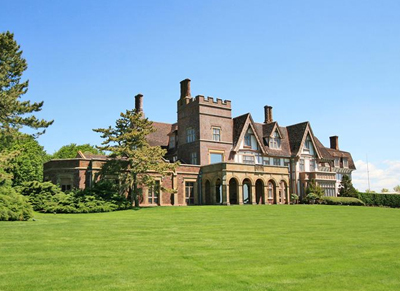 Fairholme was first created as a ‘summer cottage’ for Fairman Rogers of Philadelphia, a wealthy arts patron and engineer. Twenty years later, the Drexel family – also of Philadelphia – purchased the property and promptly enlarged and updated it, adding the Trumbauer ballroom and tower and otherwise modernizing the interior. Fairholme was the setting some wonderful parties and the Vanderbilts, the Astors, the Van Beurens, and Jack Kennedy have all been guests. Situated at the entrance of Narragansett Bay, Newport’s waterfront location made it an ideal spot for a colony to prosper in the sea trades when it was founded in 1639. More than 350 years later, the area is populated with beautiful waterfront homes, captain’s cottages, maritime wharf buildings, and other historical architecture. The guide price is $17,900,000. For further information please contact Christies International Real Estate on +1-212-468-7140 or visit www.christiesrealestate.com.